I always preferred handwriting my notes to typing as I absorbed information better. The reMarkable Paper Tablet is an electronic-ink-based tablet that’s designed to come as close to paper as possible, while offering all the benefits of a digital screen. 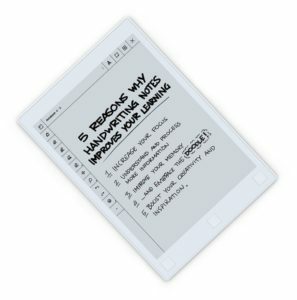 reMarkable is the “only digital device that feels like paper.” It is a great tool for taking notes, reading and reviewing documents. It’s ideal for notetaking as it features no distractions like social media, e-mail, or notifications.